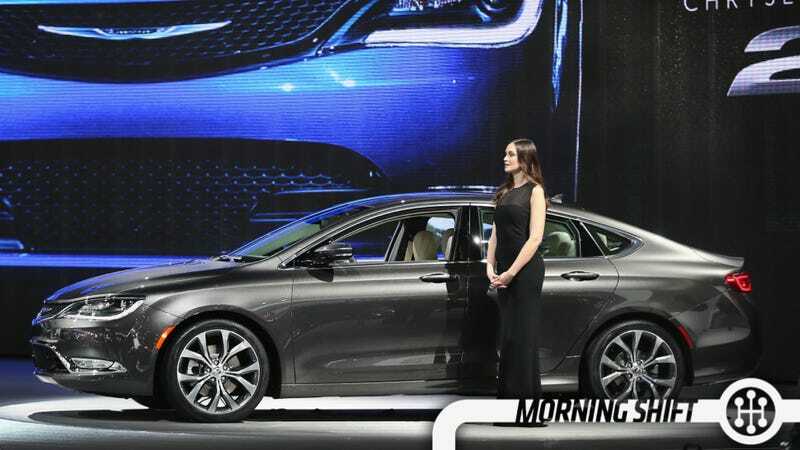 The success of the new Chrysler 200 is, in every way, a relative success. Sales for the 200 are up 40% year-over-year thanks to a new in part to cash on the hood and a new marketing campaign that makes people think it's better than the Germans and Japanese. By comparison, the Camry was only up 13.8% and the Malibu dropped 5.1%. Still, that's only 11,675 cars or, as Brent Snavely points out, about a third the number of Camry's sold that month. So, growth is good, but they're not a player yet. Chrysler 200 gaining ground as industry sales in the mid-size segment have slowed down. The launch of the 200 also comes during a difficult year overall for the midsize car segment as consumers migrate more and more to small crossovers. So far this year, sales of midsize cars now account for about 22% of U.S. auto sales, down 1.6% for the first 10 months of 2013, according to Autodata Corp.
"We don't care (about the segment decrease) because it is staggering, the sheer size of that market," Gardner said. "There is a huge opportunity for us." That's exactly right. Complaining about the slight decrease in the size of the midsize market is essentially the same as telling someone "You're not a billionaire anymore, your net worth is only $980 million!" As we've discussed, BMW is the king of German luxury car mountain, but there are princes vying for the throne... or maybe dukes? Is it a duke? I don't really get how monarchies work. BMW’s auto deliveries rose 5.8 percent to 509,669 vehicles, including Mini and Rolls-Royce models. Daimler AG’s Mercedes sales, including the Smart brand, rose 9 percent to 431,000 vehicles on new models like the GLA compact sport-utility vehicle, while Volkswagen AG’s Audi, which expanded with the A3 sedan, delivered 429,925 cars, 7.2 percent more than a year ago. I think BMW will hold for this year, but next year looks interesting. Nissan has had a great year in the United States, building cars that put a premium on design and value that's right in the sweet spot of American preferences. China — whose tastes often run similar to the U.S. — has been a harder market for reasons largely out of their control. Nissan, the most exposed of Japan's automakers to the Chinese market, said its vehicle sales in China fell 12 percent in the July-September period and cut its full-year sales forecast for the world's biggest auto market to 1.27 million vehicles from 1.43 million, an 11 percent drop. "In China, the general weakness in the LCV (light commercial vehicle) segment and increased competition in the compact car segment, as well as the persisting negative impact from political tensions on Japanese brands, hurt sales," Nissan Chief Competitive Officer Hiroto Saikawa told a briefing for reporters. All over a few stupid islands... that sit on waters of possibly massive geopolitical importance. Kia and Hyundai are setting records in the U.S., but not the records they want to set. This time it's $350 million for their bogus claims of 40 mpg for their cars. The deal comes on top of $395 million the automakers agreed to pay last December to resolve claims from the owners of the vehicles, bringing the companies' total cost for the mileage overstatements to more than $700 million. That's a lot of Rondos. 5th Gear: Just How Many GM Cars Are Unrepaired? The NYT pegs recalled cars that haven't been fixed yet at about 50%, which isn't great. And by not great, I mean not great for everyone. It's bad for car owners. It's bad for random passengers. It's bad for GM. A spokesman for the automaker said it was increasing its outreach to owners through social media and a new call center staffed with 72 employees dedicated to contacting those who have not scheduled repairs. But even owners who requested repairs months ago have been waiting, with dealers managing wait-lists and dozens of drivers writing to federal regulators in recent weeks asking why it was taking so long. Some of them are also raising safety concerns about the drawn-out timetable, as a recent fatal accident here suggests. One of the unrepaired vehicles was a red 2006 Chevrolet Cobalt that crashed here the night of Oct. 9, killing its 25-year-old driver, Brittany Alfarone. Her mother, Dierdre Betancourt, said she had tried to fix the car twice, but two dealers turned her away. May we never see a recall crisis as bad as this one again. On this day in 1979, hundreds of Iranian students storm the U.S. Embassy in Tehran, taking more than 60 American hostages. The students, supporters of the conservative Muslim cleric Ayatollah Khomeini, were demanding the return of Iran's deposed leader, the Shah Mohammed Reza Pahlevi, who had fled to Egypt in January 1979 and by November was receiving cancer treatment in the United States. After the student takeover, President Jimmy Carter ordered a complete embargo of Iranian oil. Neutral: Which Mid-sizer would you buy? Sporty Mazda? Stylish Fusion? Classic Camry? Why?